After breakfast this morning, we take a 3-hour game drive to the airstrip. We locate our THIRD group of wild dogs and spend time watching them. We also spot a range of other game, including hippos, crocodiles and elephants, as well as many birds. All of this is still terrific, but becoming somewhat second nature to us by now. We’ve failed in our six-day quest to find a leopard, but that, too, seems like part of the experience. Roger dons his new Cubs hat for our final drive. Before arriving at the air strip, though, we run into a traffic problem, as a herd of water buffalo block the road. Making it through the buffalo, we go into the VIP lounge until our plane arrives for our half hour flight to the final stop on our trip. Our short flight affords great views of the Ocavango Delta. We ride about half an hour from the airport with G, who will be our guide, then have to take a short motor boat ride to reach the camp, which is located on an island. 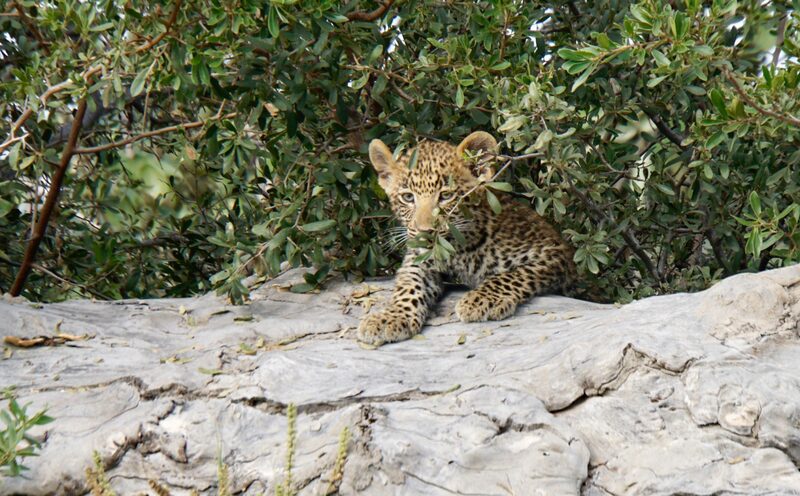 Little Vumbura is located in a 60,000 hectare private concession in the northern Okavango Delta. Set on a wooded island under the canopy of an ancient forest, the camp blends into pristine surroundings: diverse habitats of permanent swamp, small palm islands, seasonal floodplains and acacia woodlands. 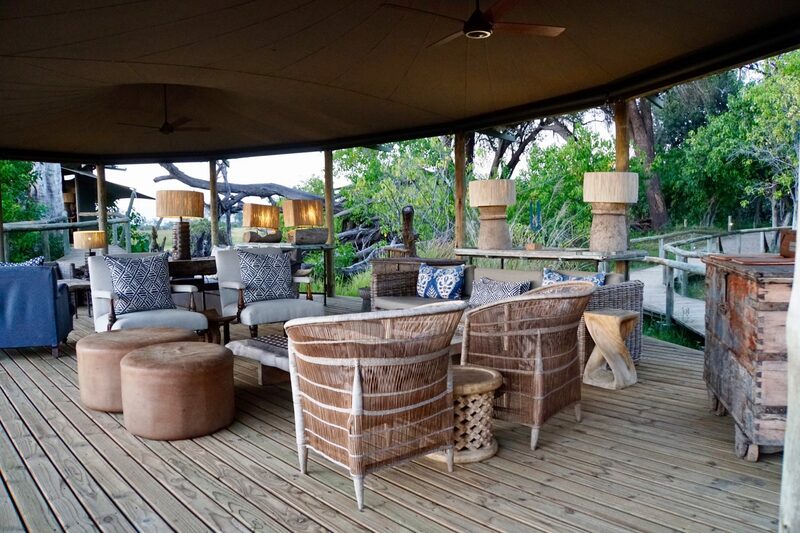 The six elevated tents each feature private decks from which to watch the wildlife. Open-plan main areas include a lounge, bar and dining room and guests can savor delicious meals under star-studded skies in the boma (traditionally a livestock enclosure). 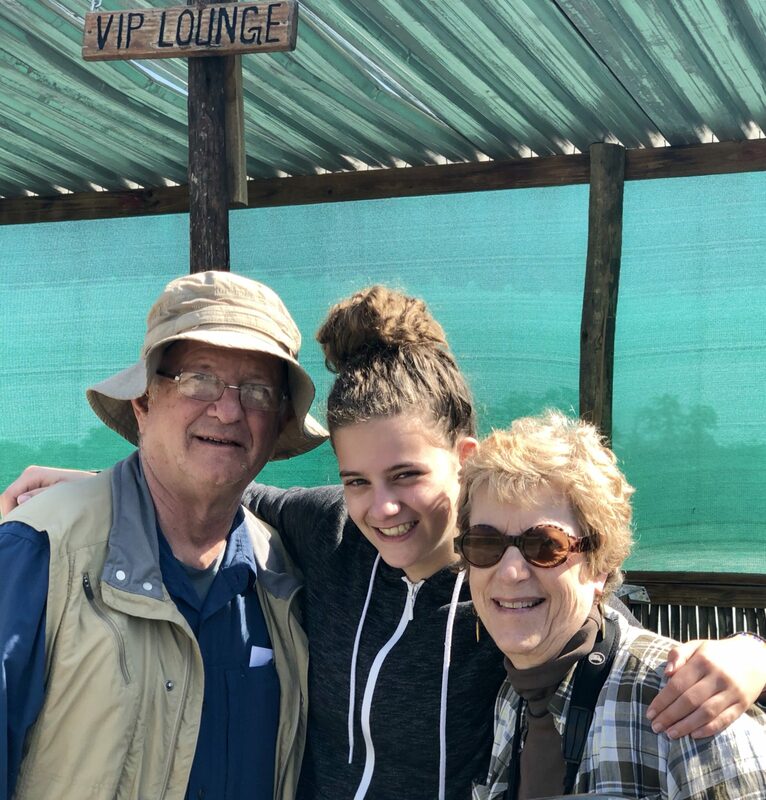 Carol and I remember Little Vumbura well and fondly, because we stayed there on our very first trip to Africa in 2003, with our friends Judd and Linda Miner, Bob Bennett and Harriet Trop. It was in no small part due to the success of that first trip that we have now been to Africa a dozen more times. 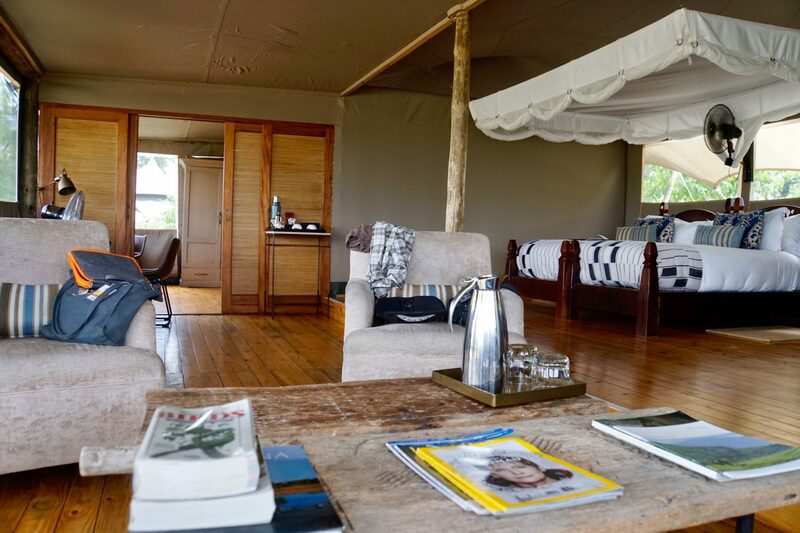 This tented camp is luxurious, a far cry from our mobile safari digs. Our “family tent” is a very nicely appointed two-bedroom, two bath suite. Two red lechwes rest in the grass outside our room and behind them lies the Delta. This place is not shabby. We have a delicious buffet lunch on the central deck, where we are joined by Bonnie and Ginny, two women from Cleveland, with whom we have a very pleasant conversation. We go to get settled in our room and rest a couple hours, sit outside for a while on our deck, with eight red lechwes now strolling beyond, before high tea, at 3:30. After tea, we take the boat across with G to set out on our afternoon game drive. 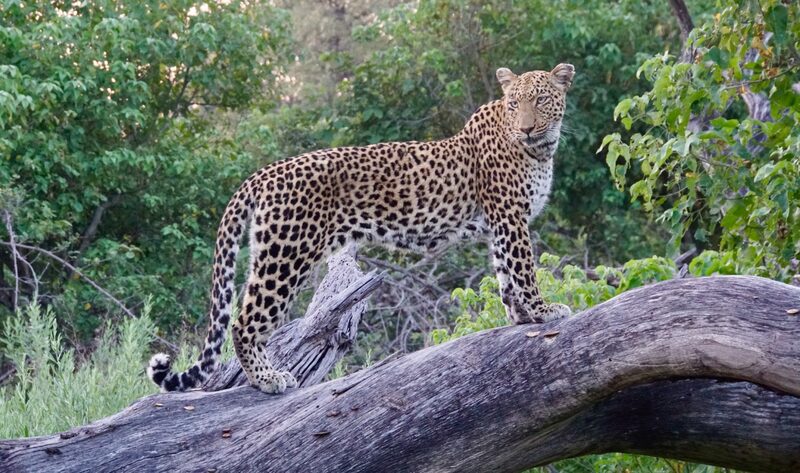 Our main objective is to locate a leopard, which guests at a sister camp have spotted in the morning. Our jeep makes it through high water and intercom radios connecting vehicles from our camp and sister camps feed information between one another. While, obviously, there’s a purpose to this communication, it’s rather off-putting coming off of the mobile tent safari experience. We locate the leopard, surrounded by tall grass and three other vehicles. Well, it IS a leopard, though, so we watch for quite some time, while nothing really happens. Eventually, the three other vehicles leave, but we decide to stick it out for at least a while. Another twenty or so minutes pass and G asks us whether we want to stay or move on. We decide to stay. 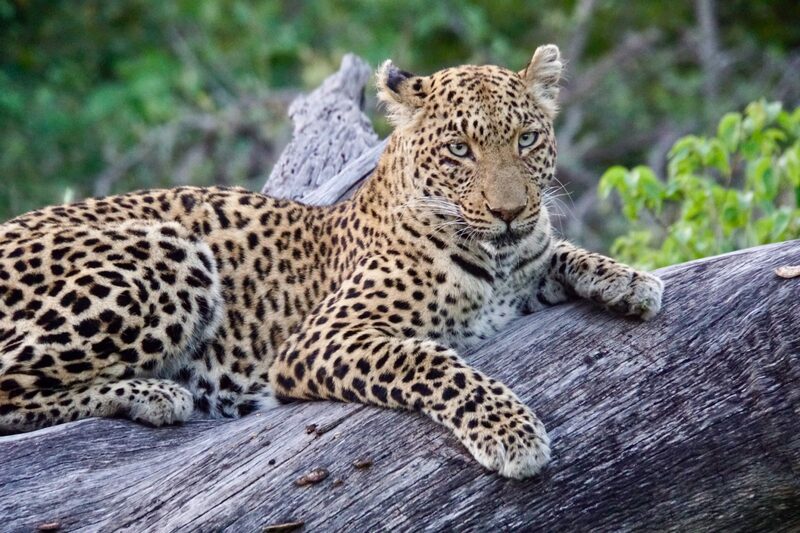 Another fifteen minutes passes, the leopard slowly rises walks over to a log, then climbs up to gain a better view. 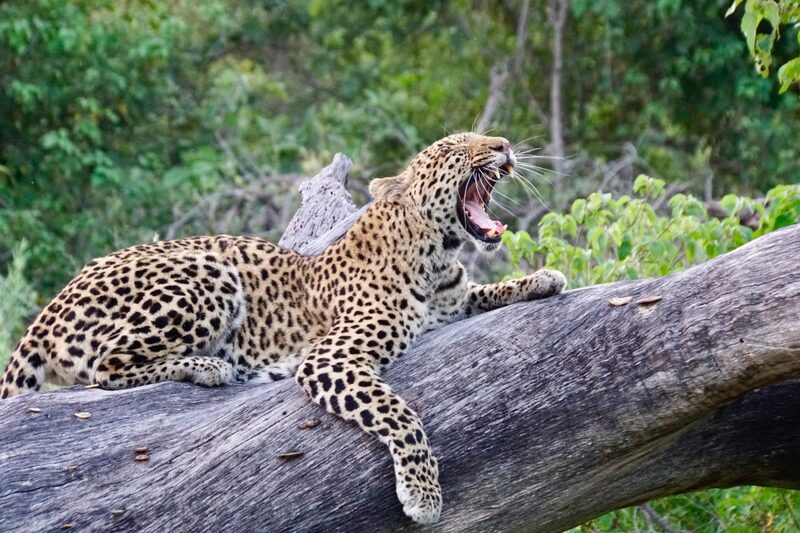 Our patience is rewarded by some incredible leopard shots. Her cub peeks out, too. A while later, the leopard leaves his perch and sets out in search of dinner. We follow her for a while, until she disappears, then, with the help of a vehicle from a sister camp, pick up the trail again, eventually losing it for good. G does not rush us back, but borrows a night search light and drives us around. We spot another giant eagle owl, elephants, a crocodile and several other birds. Eventually, we make it back through the high water on the roads and have an excellent buffet dinner, with G, on the deck of the camp. We return to our comfortable rooms to shower and blog/read before retiring. Turns out to be a fabulous first day at Little Vumbura. 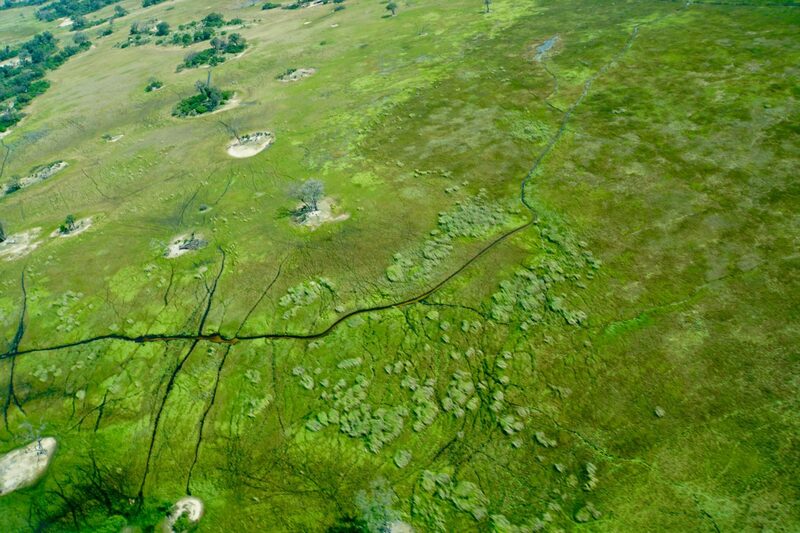 ONLY FOR THOSE WHO WANT IT, a refresher on the Okavango Delta. A journey to the Okavango Delta – deep into Africa’s untouched interior, is like no other. It is the 1,000th UNESCO World Heritage Site thanks to its extraordinary wetland system and rare wildlife. Moving from wetland to dryland – traversing the meandering palm and papyrus fringed waterways, passing palm-fringed islands, and thick woodland, resplendent with lush vegetation, and rich in wildlife – reveals the many facets of this unique ecosystem which is the largest intact inland delta in the world. The Okavango Delta is situated deep within the Kalahari Basin, and is often referred to as the ‘jewel’ of the Kalahari. That the Okavango exists at all seems remarkable. Shaped like a fan, the Delta is fed by the Okavango River, the third largest in southern Africa. It has been steadily developed over the millennia by millions of tons of sand carried down the river from Angola. From March the waters spread outwards, reaching the inner delta by June and peaking in July and August. 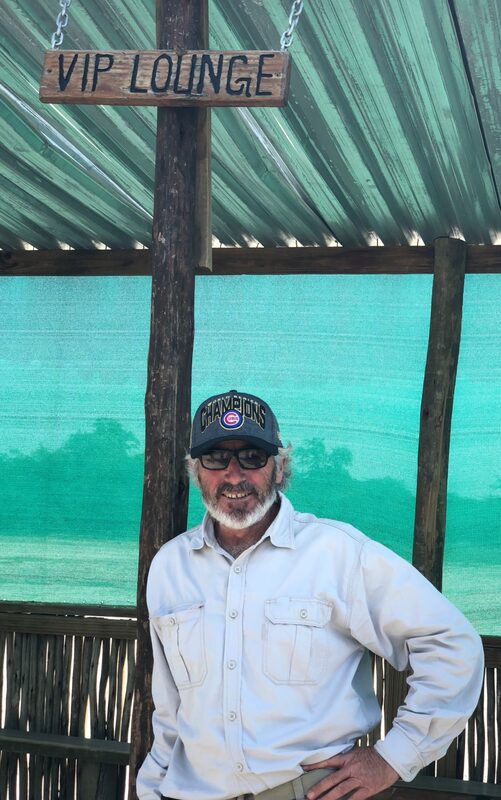 The inbound flow creates a buzz of energy as it spans out towards Maun, the country as a whole conscious of the gift the waters bring, and caught up in the primordial movement. Depending on nature’s temperamental dictates, the flood levels vary each year, never under the control of man. This makes it difficult to assess what will happen in the upcoming season: the Delta may swell up to 3 times its size. Under natural forces, the face of the earth renews itself, the landscape of channels, grasslands, reed islands and lagoons burst with life and vitality. As the levels recede in October, the earth starts to dry altering the scenery and game viewing. The summer months bring life from a new angle, and the November/December rains come, announcing the green season, and a land lush and verdant. Whether flood or rain, water, the very essence of life, plays a vital role in the Okavango Delta. Unbelievable shots of the leopard.